Yes, stories from the 95% failure rate of foster care in America are nearly impossible to believe. Foster care in America damages millions of children and families every day. States take about 670,000 children every year from biological families to place them in a stranger’s foster care with 428,000 children in state-ordered care on an average day. Outcomes for children who spend any time at all in foster care are generally horrific. States take children – essentially kidnap them – and by putting them in foster care receive billions of federal dollars. States receive thousands of dollars per month per child in foster care with bonuses if the child is medicated (most in foster care are) or has other “special needs” (such as needs medication for anxiety).States receive more bonuses for terminating parental rights and more for adopting out taken children. This article is not about good foster parents who truly rescue children in grave danger of harm and injury. My friends know foster parents caring with love and patience for children horribly abused by biological families. I personally know children and adults with severe disabilities who live in neighborhoods where they work and make friends after foster and adoptive families nurtured and taught them well. As our opioid crisis explodes, we will need even more families to care for the young victims of parental overdoses. Still, 95% of the time, states take children for unsubstantiated reasons while inflicting deep trauma on child and family. Oddly, solutions to the systemic failure of foster care literally meet up at the courthouse with the fathers’ movements and other reform efforts taking aim at family court decisions in child custody cases. In 2017, activists are joining forces. This article starts with foster care and ends with an urgent cry for culture change throughout our family court systems. Educate yourself– Learn how family court operates; learn what your state says about parental rights; use the words parental rights, constitutional rights and parental alienation. Yvonne could not afford an attorney and filed for a Guardian ad Litem (GAL) – someone the Court appoints to present Yvonne’s evidence in court. In her case [which is not typical], the GAL recommended Yvonne have physical custody of her son. Find local support groups– Use different words for your online search including: parents rights, taken children, foster care reform, father’s rights. Some have their own websites: Americas Taken Children; I was Erased; Medical Kidnap; and Parents Against CPS Corruption (PACC). Like many of you, my heart was and is still broken. Because of this, I once felt I would never fully recover. Though it took time, I regained myself through the process of self-healing. I still mourn the loss of my children after being stolen out of my life and will never understand why this happened. However, my spirit is now restored to a level that allows me to fight for them in a way I could not do before. They need me and I need them. I will not fail in my duty of restoring our bonds to a point where we can be a family again. The alienator and those who assist them felt they could defeat me – they were wrong. I am stronger now and will not allow them to continue their wrongful actions. A Coalition of Support Groups: The Million Parent March in Washington, D.C. on September 18, 2017 aimed to raise awareness about the abuses and failures of foster care and family courts. Although only three hundred or so actually marched, later that day, in the Upper Senate Park of our nation’s Capitol, the sharing of personal stories began as mothers, fathers, grandparents, family advocates, court reform activists, a musician and a filmmaker described lost children and broken families. A deep grief permeated many small conversations with anger and betrayal spiking in others. Every advocate I spoke with believes public awareness of the damages done by foster care and family court could trigger dramatic agency transformation. Changing the culture of foster care and family court only occurs with new leadership.The first step is a clear mission that prioritizes child safety and emphasizes family preservation including kinship groups. Culture change will require new training and performance measures that evaluate staff on child safety and family reunification not adoption rates. A long list of broken policies must be fixed such as no staff bonuses for taking children or terminating parental rights. No more taking children without a warrant or court order. More rigorous protocols to screen foster parents and group homes. New leaders can mark a new beginning – with many watching. “Child Welfare policy and practice must always balance the need to ensure children are safe, while assuming that with the right level of support and services, the vast majority of parents can, and will, provide what their children need. Practitioners of child welfare should always be mindful that involvement with an abuse assessment can cause stress to a family unit. When safety cannot be assured and risk cannot be mitigated, a child-centered system always strives to keep the child in the care of alternative caregivers that know them and are willing to step in while their parents are unable. In Iowa, we have made the commitment to continually reinvest in our child welfare system in order to ensure efficiency. Financial resources and knowledge are used to help us continue to do better. An example of this …reinvest[s] money allocated for our group care providers into our preventive services, so families receive services with their children still in their home. The money that is not spent on providing group care services has consistently been reabsorbed into child welfare and redirected to our contractors that provide in-home family preservation services. This has been proven to be an effective strategy for reducing Iowa’s group care census and lowering the rate of children entering foster care. Another example is the Parent Partner program, which is unique and offered across the entire state of Iowa. This program employs parents who have had their children removed – usually as a result of drug use – and have improved their life to the point they are now able to be a resource to other parents who are going through similar situations. Parent Partners are hired, trained, mentored, paid and supported. This is a great example of Iowa reinvesting in its child welfare system to create organizational change. The Parent Partner program recently underwent a research evaluationwhich demonstrated the program to be statistically effective in returning children to their home without returning to foster care due to subsequent reports of abuse and neglect. Well-known family attorney and previous county prosecutor Connie Reguli, spoke at two days of events in Des Moines and Clinton, Iowa in October 2017. She titled her presentation: Fo$ter-Gate: A look at government-sanctioned child trafficking and how we change our future. States have essentially unlimited Medicaid funding to medicate any child in state custody. Follow the money. Many different streams of money flow into the foster care arena propping up a compromised system with perhaps $50 billion dollars per year. The dollar count starts with the total fiscal year 2017 federal Child Welfare Budget for Title 4-B and 4-E of the Social Security Act was a little more than $7.9 billion dollars going to states. Isham estimated that federal financial incentives to states for taking and keeping children in foster care starts at a $72,000 baseline per child per year then adds in bonuses for Termination of Parental Rights and special adoptions that could reach $10,000 per child. He estimated[i] income to Arizona for nearly 18,000 children in foster care to be about $1.2 billion. Transforming foster care in America requires changes to federal payments and incentives. Laws related to foster care and child protective services must shift from federal funds only for out-of-home child welfare to greater funding for expanded, quality family services. Existing legislation needs new language to support family preservation, kinship groups and shared parenting. Funding streams must distinguish between poverty and true neglect so a leaky roof or unpaid water bill does not result in children removed from families. Medical kidnapping is real. This is when doctors and hospitals are involved with Child Protective Services in taking children from parents, often over medical disagreements such as asking for a second opinion. States take newborns from hospitals far more than most people realize. There is, sadly, a market for babies for the adoption and foster care industry, with huge financial incentives to the states via ASFA [the Adoption and Safe Families Act] to the tune of billions of dollars. States access these funds by taking children from their families. Require actual evidence before dividing a family or terminating parental rights. In most states, hearsay is actually admissible in family court. Require courts consider all exonerating evidence. Often the parents have proof of their innocence, but that evidence is either ignored or not even presented to the judge. End closed courtrooms. End the “confidentiality” laws that shield the system from exposure when they are the ones guilty of abuse. Require the 4th Amendment [that prohibits unreasonable searches and seizures], that a child cannot be seized without a court order or warrant or ACTUAL emergency circumstance. Termination of Parental Rights is the family court equivalent of the death sentence. Yet, unlike criminal court, there is a low burden of proof. Stop the use of Child Abuse Specialists in hospitals. These are doctors who specialize in finding abuse, often when there is none. They are not trained in orthopedics or radiology or neurology, and they frequently neglect to do differential diagnoses testing. Legal changes and challenges are slowly moving in the right direction. Individual and class action lawsuits moving toward the Supreme Court filed by fostered or adopted adults foreshadow enormous change. In December 2016, California’s 9th Circuit Court “Right to Lie” case overruled historic immunity laws that allowed state social workers to lie in court and misrepresent family conditions. Other lawsuits moving toward the Supreme Court involve youth taken without cause or placed in abusive foster homes to seek damages from the social worker and the city or county. 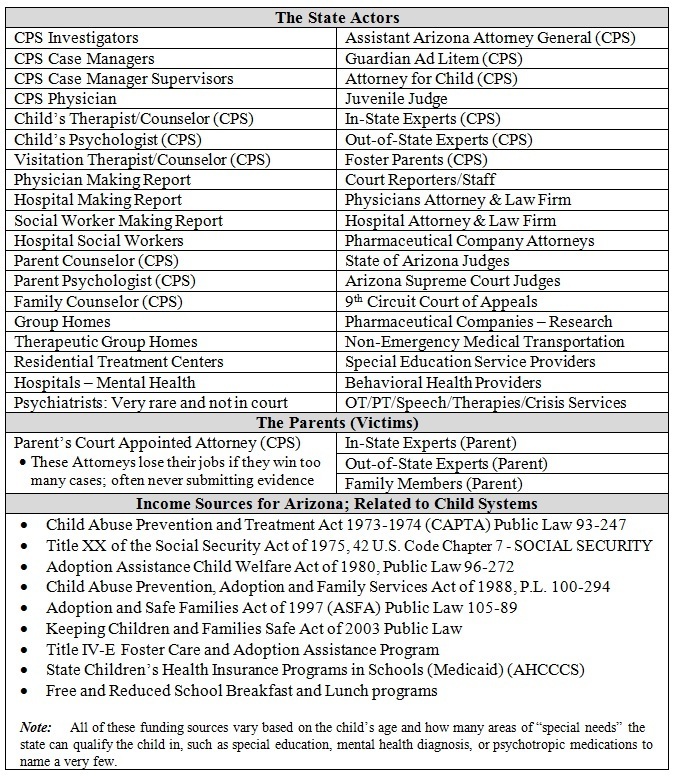 In October 2017, a US District Court judge ruled a law suit against the Arizona foster care system could move forward as a class action lawsuit – all children in the foster care system would be included. We must reaffirm and protect family integrity and independence from government interference. “The family court, child protection agencies and the families of #TAKEN children must meet at a common table of a fair Family Court process in which the laws for reunification and kinship placement are followed in a meaningful way. Maximization of dollars must not dictate the outcome of a case. Children must not be torn from everything and everyone they know and love in order for an agency and court to self-perpetuate. The future wellbeing of the children must be given EVERY consideration. Final Comments: The damage perpetrated when State agencies take children into foster care and the heartbreak inflicted by the win-lose culture of family law brings long-lasting pain to millions of American children and families. My hope for dramatic change comes from the growing coalition of different groups fighting for social justice and working to promote balance in child welfare and child custody decisions. The questions headed for the Supreme Court take on state’s rights versus Constitutional protections. Is state government interference in lifestyle choices and family dynamics constitutional? Are state social workers and child protection agencies truly immune from lying in court or misrepresenting family conditions? Do children have the Constitutional rights to due process and protection from unwarranted seizure? Do children have a Constitutional right to family relationships? Where is judicial oversight in the 21st century? As a systems thinker and strategic planner, I organized solutions to a broken family law and family court system into five strategies: take personal action; find support groups; transform county and state agencies; change federal and state laws; and transform the win-lose culture of family law. As I meet advocates and activists fighting for change – and many fighting for calm while struggling with the pain of lost children – I remain in awe of the courage and grace of so many parents and grandparents. A coalition is building; justice is ahead. Dr. Kahn has written a stellar composition presenting all aspects of the crisis we are facing in family courtrooms in America. Decisions based in funding and not Constitutional Due Process are currently the standard of family court judges. Creating a nightmare for families trying to get their children home or placed in kinship care. It is vital that lawmaker’s acknowledge and address the blank check funding available for TITLE IV and completed adoptions. The Federal Adoption Incentive Program has created an industry out of what once was a charity of compassion for the parentless child(traditional orphans). Child Protection Agencies are creating parentless children to serve the highly lucrative adoption industry. Primarily to capture billions in federal dollars. We must act quickly. To date U.S. Congressmen refuse to address the nightmare they have created for American families by putting a price on the warm bodies of American children. Great article Lynn. Hopefully our government acts soon. Part of the solution lies in non-violent civil disobedience by affected parents, grandparents, brothers, sisters, uncles, aunts and friends. I should add, relentless non-violent civil disobedience en masse. This was the way of Rev. Dr. Martin Luther King and others who fought on the frontlines for civil rights and social justice. So too those who fought for women’s rights, gay rights, worker’s rights and more. Forget about the government acting soon or acting at all. They are in on it. Who do you think incentivizes this whole kidnapping & trafficking scam on the American public. In many cases, the government matches on a 1:1 basis monies collected by counties for child support, etc. In many cases, it is a 2:1 and 3:1 match. And, sadly, business is good. If we want real systemic change, we must demand it, fight for it and force it! Nothing in U.S> history has ever been achieved other than through a moral outrage and a public outcry. Look up our history and you will see that to be true. major media. On our side are the people of the world and a power greater than money or weapons: the truth. we organise with one another, when we get involved, when we stand up and speak out together, we can create a power no government can suppress. We live in a beautiful country.